Saint Francis of Assisi was born in 1182, the only son of Pietro Bernardone, a wealthy cloth merchant of central Italy. Peitro gave his son the name of Giovanni at baptism, though he afterwards altered his son's name to Francesco, perhaps in honor of his trading in France. Pietro's worldly success had secured for the young Francis a care-free life of material comfort. Francis was a popular youth, often the center of attention, who could be found engaged in sport, frequenting the piazze of the city, or confidently serenading the young women of Assisi. Francis eagerly sought the glory and honor of battle and in 1201, at the age of 19, outfitted himself as a knight in order to join the war with Assisi's rival, Perugia. After an abrupt defeat, however, Francis spent nearly a year as a prisoner of the neighboring city-state while his father raised the money in 1203 to pay his ransom. Though he turned frequently to the Sacred Scriptures for comfort, imprisonment and illness had shattered his self-assurance. Moreover, instead of reassuring him, the Gospel challenged Francis with the still unfamiliar values of Christian discipleship. In 1205 he again tried to outfit himself as a knight, but after suffering another illness, he had a vision that marked the beginning of his conversion. He was 23 years old. Uncertain and pensive, he returned to Assisi where his initial depression soon became an emotional crisis. His old way of life and his old friends left him feeling disillusioned and empty. His evident dissatisfaction with the material comforts of his life frustrated his father, particularly as Francis spontaneously began to share his family's wealth with the poor. Indeed, the lack of understanding between the two provoked harsh, angry words from the father and a sullen, hostile silence from the son. Pietro failed to recognize the turmoil in his son; Francis could not express himself to his father. Born of a crisis of human understanding, his search for inner peace and new direction put Francis on the road to conversion. Heavenly Father, help us to be faithful to you. to forgive and to understand others. through respect, consideration and warmth. One day in 1206, as Francis, now 24 years old, prayed in the tiny church in San Damiano, Christ spoke to him from the crucifix saying, "Rebuild my Church." So Francis set about the task of rebuilding the forsaken wayside chapel of St. Damian in the valley below Assisi. Although he believed that the task of "rebuilding" the Church was just a matter of stones and mortar, his life-style changed accordingly. Many people thought that he had gone mad, and his family must have been embarrassed by his behavior. Nonetheless, some were attracted to the simplicity and sincerity of his new life. The growing friction between Francis and his father exploded publicly in October of 1206 when Pietro Bernardone pursued his son to the central piazza of the city and demanded repayment for all that Francis had squandered in his generosity to the poor—and for the money Francis had spent in his restoration work. Before all the townspeople gathered there, Francis stripped himself naked, renounced his hereditary rights, and gave his fine clothes back to his astonished father. The Bishop of Assisi, who had witnessed the dramatic gesture, wrapped his cloak around the young man, who thereafter dressed himself in a simple flaxen tunic tied at the waist with a cord. Hence Francis solemnized his "wedding" with his beloved spouse, the Lady Poverty, under whose name he surrendered all worldly goods, honors, and privileges. Whatever the attitude of the people around him, Francis began to recognize the true nature of God's call. While Francis thought initially that he was called to reconstruct a dilapidated building—and though he also restored two other deserted chapels, St. Peter's, some distance from Assisi, and St. Mary of the Angels of the Porziuncola in the valley below Assisi—he gradually came to recognize his vocation in rebuilding the spiritual life of the Church by bearing witness to the saving power of the Gospel. The young men of Assisi began to take notice of the remarkable change that had overtaken Francis. One night, Bernardo da Quintavalle observed the unsuspecting Francis as he repeatedly prayed "My God and My All." Inspired by his friend's piety and devotion, Bernardo gave away his vast fortune and joined Francis in order to live more fully the call of the Gospel with him. As others joined them, the city of Assisi marvelled at how many of its young men would forsake material comforts to follow Christ in poverty. In 1209, Pope Innocent III had a dream in which he witnessed the walls of the great Lateran Basilica, the symbol of the universal Church, slowly falling down. Before the utter collapse of the church, however, a small man wearing a simple gray tunic tied at the waist by a cord rushed up to support the church and prevent its collapse. Meanwhile, in 1210 Francis walked to Rome with his band of followers in order to obtain the blessing of the Pope on the founding of his Order. On seeing him, Pope Innocent recognized Francis as the figure in his dream and eagerly blessed him and his followers and verbally approved their rule of life through which they would renew the Church. Several years later Clare, the daughter of a nobleman of Assisi and ten years younger than Francis, begged to join his Gospel life of poverty. So Francis received her in 1212 with several other young women and placed them in a monastery where they developed a contemplative rule which expressed their commitment to peace, to prayer, and to solitude. By successfully integrating Franciscan spirituality with the monastic lifestyle, Clare of Assisi proved to be one of the great religious innovators of her age. help us in our uncertainty and guide us always. Calm our unsettled hearts and give us peace. sustain our commitment to Your holy service. After accepting his call to live the Gospel, during the years of 1207-1209 Francis dedicated himself to a life of prayer and solitude. One day, in a singular moment of personal conversion, Francis encountered a leper. In his age, lepers were forced to ring a bell wherever they went and to cry out the warning: "Unclean!" Society had embedded in Francis an incomparable loathing for persons afflicted with this class of illness. He had always feared both the disease itself and the horrible disfigurement it wrought. Customarily he reacted to lepers with repugnance and anxiety. Like so many of his contemporaries, his personal revulsion affected the further humiliation of these afflicted persons and added to their suffering. Nonetheless, in a decisive moment of illumination, Francis suddenly perceived in this leper the embodiment of God's beauty, a human being to be loved and cared for tenderly. By embracing the leper, the Saint learned to embrace all people just as Jesus did. As a community, the friars nursed and bathed the lepers, beginning the Franciscan tradition of special attention to the poor and outcast. When Francis learned to understand and cherish each individual person as a unique reflection of God's creative genius, a true attitude of human concern and compassion began to form within him. Through grace, Francis turned his initial revulsion at the sight of a leper into a personal triumph over judgment, bigotry, and false assumptions. This impulse led, in turn, to a movement of peace that would affect legions of people for centuries. the insight and courage to cherish every human person. too sinful and unprepared to follow in his footsteps. one another according to the light of the Gospel. As Francis' reputation for holiness and peace spread throughout his native Italy, people called upon him to resolve their disputes and to deliver them from danger and violence. On one such occasion, the people of the small town of Gubbio alerted Francis to the presence of a ferocious wolf in their countryside. All efforts to trap the wolf or drive him away had failed, so they called upon the Saint to intervene. He went out with only the message of the Gospel: no weapon, no sanctions, no threatening bravado. Francis met the wolf and called him to repentance for the chaos and harm that he had caused. The wolf and the townspeople agreed to live in peace; the wolf would refrain from attacks and the townspeople would feed the wolf for the rest of his life. As is frequently the case, such pious legends often have a basis in history and scholars have long thought that this popular narrative of Francis exercising miraculous power over the world of animals has at its core a factual account of no lesser spiritual importance. It may well be that the term "Wolf of Gubbio" signifies an epithet attached to a notorious outlaw of the period, who both raided livestock and robbed people as well. Confronted by armed villagers, the "Wolf" nonetheless prevailed, being either more skillful with weapons or more ruthless in nature. Francis, however, neither confronted him with arms nor threatened him by sanctions. Rather, he challenged the robber in the name of the Lord to reconcile with his victims and so to experience the peace that only Christ can bring. Thus, the legend of the "Wolf of Gubbio" points to a more enduring dimension of Francis' historical ministry, namely, the reconciliation of sinners and their reintegration into the fabric of social life through the grace of forgiveness. and to experience reconciliation in our lives. to affection and understanding for others. The spirituality of Saint Francis derives from his clear and constant focus on Jesus Christ, the God who shares our humanity. Francis saw the self-imposed poverty and humility of Jesus as the gateway to our saving encounter with God. This so overwhelmed the poor man of Assisi that he sought to follow, in strictest poverty, the Christ who loved us without limit. To drive home the astonishing humility with which God embraced the human condition, the Saint decided visually to re-create the Bethlehem experience in a cave among the hills of central Italy. Carrying a small infant in his arms, Francis led the people of Greccio in procession with their various farm animals to a grotto where the Saint made the Christmas liturgy itself a dramatic celebration of the mystery of the Incarnation. Though Francis considered himself unworthy to be a priest, he had been ordained a deacon so that he could preach the Gospel with the blessing of the Church. At Greccio, wearing the dalmatic, the vestment of a deacon, he proclaimed the Christmas Gospel at Mass and, with his simple gesture of placing an infant in the manger, forever imprinted our hearts and minds with the love of God made flesh in Bethlehem's tiny child. Thus Francis began a tradition that persists to this day: the Christmas crÃ¨che. Francis spent the remainder of his life preaching the loving mercy of that God made flesh, supporting his brothers in the Community and praying with the greatest devotion in union with Jesus. at the nearness of our God. that our lives may be filled with Your peace. Amen. Aflame with desire to preach the Gospel and win the prize of martyrdom, Francis decided to make Jesus known in the Muslim world. Thus, in the midst of the Fifth Crusade of 1219, Francis dramatically crossed the battle lines at Damietta in order to speak with Malik al-Kamil, the Ayubid Sultan of Egypt. Intrigued by the courage and simplicity of this bold but unassuming man, the Sultan recognized in Francis a Christian unlike any other. In their meeting, did they exchange their respective visions of the world and God's role in it? Historians report that Malik al-Kamil was moved by his words and listened to Francis very willingly. With admiration for his visitor, the Sultan spared Francis and sent him back to Italy. Two greatly different men had met in the spirit of respect and concern—one with remarkable temporal authority, the other with unsurpassed spiritual energy. Perhaps each of them recognized the Spirit of God at work in the other. Francis returned to the Christian world to take up again the challenge of preaching and living the Gospel. By sparing his life, al-Kamil had given Francis a renewed sense of purpose. The Lord did not fulfill his desire for martyrdom, reserving for him instead a different task. God wanted Francis and his brothers to reinvigorate every aspect of Christian society with the concrete experience of God's loving mercy. For Francis and his brothers, Divine mercy would find its expression in tolerance and compassion, the precursors of reconciliation and unity. with which you have endowed each of us. mutual acceptance to our world. Throughout the years that followed his conversion and public commitment to the Gospel, Francis' life and attitude continued to change remarkably. More and more, his days were consumed in the ongoing experience of deep spiritual union with God. During the Lent of 1224, two years before his death, his mind and heart turned frequently to meditate upon the suffering of Christ and His obedience to the Father. Retreating with Friar Leo into the wilderness, Francis agonized over the great pain that Jesus experienced and thanked our Lord for the supreme sacrifice that He had endured. On 14 September 1224, in the solitude of prayer on Mount Alverna, while praising God and pouring out his love for Him, Francis beheld the crucified Christ borne aloft by six wings. In this moment of seraphic ecstasy, he who had sought to imitate Christ in all things, received the marks of his Lord's crucifixion—the stigmata—on his hands, feet, and side. the grace of intimate union with Your crucified Son. we too may know the peace and joy that Francis received. Saint Francis died on the evening of 3 October 1226, at the age of 44. Francis was canonized by Pope Gregory IX on 16 July 1228, at the church of St. George (now within the enclosure of the monastery of St. Clare), where his body had been provisionally entombed. When construction of the double basilica of St. Francis was completed just a bit less than two years later, Brother Elias of Cortona secretly transferred the saint's remains to a tomb under the high altar of the lower basilica. Brother Elias reported that at Francis' death "his appearance was one of great beauty gleaming with a dazzling whiteness and giving joy to all who looked upon him." Did he who had imitated Christ so closely in earthly life now come to resemble Him in the glory of the eternal life? Could it be that Francis had come to share in the very divinity of Christ? The glory that enveloped Francis at his death is nothing less than the fulfillment of Christ's promise to sanctify His followers and draw them into more perfect union with Himself. As he lay dying, Francis told his brothers, "I have done what was mine to do, may Christ now teach you what you are to do." But let us not sentimentalize Brother Francis. If you stand on the steps of the National Shrine of Saint Francis of Assisi and listen to comments made by tourists as they pass by the church, you might hear someone say, in passing, "Oh, Saint Francis. I learned about him in school. He's the patron saint of animals!" To understand just how much this popular sentimentality misses the point about genuine holiness, consider the world in which Francis lived. Italy in the twelfth and thirteenth centuries was a place of constant war, political scheming, and, often, outright cruelty. And in that world people treated animals with even worse cruelty than they treated their neighbors. In fact, the unnecessary infliction of pain and suffering on animals was a social norm right up until the latter half of the nineteenth century, when the legal system began to adopt anti-cruelty laws. Francis anticipated these laws by over six hundred years. He wasn't a mere sentimentalist about bunnies and birds and pets—he simply lived from his heart the respect for all creatures—animal and human—that Christ's Incarnation brought into the world. Through humble divine love, Francis discovered the same compassion that human laws, centuries in the future, would require of us all. And so Francis was a perfect example, in a reverse sort of way, of the fact that "love is the fulfillment of the law." Francis' compassion for all creatures, however, was not an "anything goes" liberality. Nor was it a political attempt to advocate "diversity"—and sin. It was a compassion deeply grounded in the reverent awareness that divine Will calls us, one and all, without discrimination, to repent our sins. Just as Christ sat with sinners in order to preach to them, Francis cast his joyful love upon all that everyone might repent a life of sin and choose to live in holiness, as Francis himself had chosen. "Woe to those who die in mortal sin!" he wrote in his majestic canticle. May we all aspire to the holiness of life with which Saint Francis served his Creator. At first glance, the San Damiano crucifix gives the impression that Christ is merely standing before the cross, not hanging from it in agony. After all, Roman crucifixion was an ugly form of torture that left the condemned hanging from their arms by their own weight to die a slow death of suffocation. Some of the condemned were tied to the cross with ropes, and, in certain cases, as with our Lord, nails were driven through wrists and ankles to grind against raw bone, setting nerves afire with searing pain. And yet here, in this image, Christ seems to be almost serene. What, then, could be the reason for such an odd depiction of the central mystery of Christian faith? Well, look a bit closer and notice the background scenes that actually define the shape of the cross. First, behind the center of Christ's body, you can see the figures described in John 19:25–27: on the left, his mother Mary along with John himself, and, on the right, first his mother's sister Mary the wife of Clopas, then Mary of Magdala, and then the centurion who proclaimed, "Truly this man was the Son of God!" (Mark 15:39). The smaller figures depict the soldier Longinus on the left with his spear, and on the right the man who put the sponge soaked in wine to Christ's mouth. This central part of the image therefore depicts the mystery of the Crucifixion. But now look at the arms of Christ. What do you see behind them? That long, dark, rectangular area is Christ's tomb. But not just the tomb—the empty tomb. Notice the four angels along the bottom and the figures of Peter and John, as described in John 20:2–10, peering into the emptiness with amazement. This part of the background, then, represents the mystery of the Resurrection. Finally, look at the T-shaped area above Christ's head. There you can see Christ rising up into heaven; above his head the hand of the Father gives his blessing. For here, at last, is the culmination of his earthly mission and his return to his place at the right hand of the Father: the mystery of the Ascension. 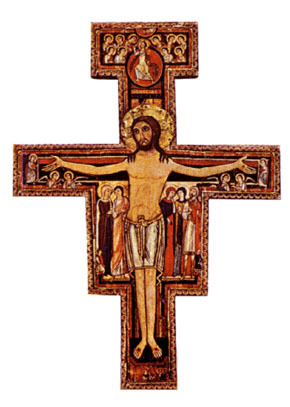 So the entire San Damiano crucifix depicts not just the fact of the crucifixion, but it depicts the three mysteries that reside behind the crucifixion. To the world, the cross is a stumbling block and foolishness (1 Corinthians 1:23); but to the eyes of faith the cross is the Crucifixion, the Resurrection, and the Ascension, in their full simultaneous reality. This image, of course, is the image that converted Saint Francis from a life of self-indulgence to a life of total obedience to God's will. Francis learned to rejoice in the overwhelming beauty of God's creation—a beauty signfying God's love—yet he did not desire anything of the material world for his own fulfillment. Instead, he desired nothing but to receive our Lord with a pure heart and chaste body. And, as he showed through the rest of his life, Francis fully understood the reason for the odd depiction of Christ's serenity upon the San Damiano crucifix. For when someone accepts injustice, cruelty, and contempt with patience, without being ruffled and without murmuring, and endures it all with charity and total faith, what else can we call it but perfect joy? And so, right from the beginning, Francis understood that the "background" to all human suffering must be total faith in the ultimate triumph of the Cross. Saint Francis, together with friar Leo and friar Bonizo from Bologna, an expert in canon and civil law, composed the Regula Bullata (the Approved Rule of Life) of 1223. On 29 November 1223 Pope Honorius III formally approved the Rule by the bull "Solet annuere." The rule and life of the lesser brothers is this: To observe the holy gospel of our Lord Jesus Christ, living in obedience without anything of our own, and in chastity. Brother Francis promises obedience and reverence to the Lord Pope Honorius and his canonically elected successors, and to the Roman Church; and the rest of the brothers are obliged to obey Francis and his successors. If someone should wish to adopt this life and should come to our brothers, they must send them to their provincial ministers to whom alone is granted the right to receive brothers. The ministers should examine them carefully regarding the Catholic faith and sacraments of the church. If they believe all these things, wishing to confess them faithfully and observe them diligently until the end; and if they have no wives, or their wives have entered a convent, or permission has been given to them by authority of their bishop, a vow of chastity having been taken and their wives being of such an age as to avoid suspicion; then let them go, sell all they have, and attempt to give it to the poor. If they cannot do so, their good intention will suffice. Let the brothers and their ministers beware of becoming concerned about the new brothers' temporal possessions, for they should freely dispose of their belongings as God inspires them. If they ask advice, the ministers may refer them to some God-fearing brothers through whose counsel their possessions may be distributed to the poor. Later, let them concede clothing of probation to the new brothers: Two tunics with hoods, belt and trousers, and a chaperon reaching down to the belt, unless the minister decides according to God that something else should be done. When the year of probation is over, let them be received into obedience, promising to observe this life and rule always; and, according to the command of the lord pope, it will be absolutely forbidden to them to leave the order, for according the holy gospel "no one who puts his hand to the plow and then looks back is fit for the kingdom of God." And let those who have promised obedience take one tunic with a hood, and let those who wish it have another without a hood. And those who must may wear shoes. All the brothers are to wear inexpensive clothing, and they can use sackcloth and other material to mend it with God's blessing. III. Concerning the divine office and fasting; and how the brothers ought to travel through the world. Clerics are to perform the divine office according to the rite of the Roman Church, except for the Psalter, and they can have breviaries for that purpose. Laymen are to say twenty-four "Our Fathers" at matins; five at lauds; seven each at prime, terce, sext and none; twelve at vespers; and seven at compline. They should also pray for the dead. They should fast from the feast of all saints until Christmas. Those who voluntarily fast at Quadragessima, those forty days after Epiphany which the Lord consecrated with his own holy fasting, will themselves be blessed by the Lord; yet they are not required to do so if they do not want to. They must fast during Lent, but they are not required to do so at other times except on Fridays. In case of obvious necessity, however, they are excused from bodily fasting. I counsel, admonish and beg my brothers that, when they travel about the world, they should not be quarrelsome, dispute with words, or criticize others, but rather should be gentle, peaceful and unassuming, courteous and humble, speaking respectfully to all as is fitting. They must not ride on horseback unless forced to so by obvious necessity or illness. Whatever house they enter, they are first to say, "Peace to this house" (Luke 10:5). According to the holy gospel they can eat whatever food is set before them. I strictly forbid the brothers to receive money in any form either directly or through an intermediary. Nevertheless, the ministers and custodians can work through spiritual friends to care for the sick and clothe the brothers, according to place, season and climate, as necessity may seem to demand. This must be done, however, in such a way that they do not receive money. Those brothers whom the Lord favors with the gift of working should do so faithfully and devotedly, so that idleness, the enemy of the soul, is excluded yet the spirit of holy prayer and devotion, which all other temporal things should serve, is not extinguished. As payment for their labor let them receive that which is necessary for themselves and their brothers, but not money. Let them receive it humbly as befits those who serve God and seek after the holiest poverty. VI. That the brothers should appropriate nothing for themselves; and on how alms should be begged; and concerning sick brothers. The brothers should appropriate neither house, nor place, nor anything for themselves; and they should go confidently after alms, serving God in poverty and humility, as pilgrims and strangers in this world. Nor should they feel ashamed, for God made himself poor in this world for us. This is that peak of the highest poverty which has made you, my dearest brothers, heirs and kings of the kingdom of heaven, poor in things but rich in virtues. Let this be your portion. It leads into the land of the living and, adhering totally to it, for the sake of our Lord Jesus Christ wish never to have anything else in this world, beloved brothers. And wherever brothers meet one another, let them act like members of a common family. And let them securely make their needs known to one another, for if a mother loves and cares for her carnal son, how much more should one love and care for his spiritual son? And if one of them should become ill, let the other brothers serve him as they themselves would like to be served. VII. On the penances to be imposed on sinning brothers. If any of the brothers should sin mortally at the instigation of the enemy, they should recur to their provincial ministers without delay if the sin is one of those for which such recourse is required. The ministers, if they are priests, should mercifully prescribe a penance for them. If they are not priests, they should see that it is prescribed by others in the order who are such, as seems best to them according to God. They should be careful not to become angry and upset over someone's sin, for anger and perturbation in oneself or others impedes love. VIII. On the election of the general minister of this brotherhood; and on the chapter at Pentecost. The brothers are always bound to have a brother of the order as general minister and servant of the entire brotherhood, and they are strictly bound to obey him. When he dies, his successor is to be elected by the provincial ministers and custodians during the Pentecost chapter, at which provincial ministers are always to assemble in the place designated by the minister general. The general chapter should meet every three years, or sooner or later if the minister general should so ordain. If at some point it should appear to the provincial ministers and custodians that the minister general is incapable of serving the brothers properly, the aforesaid brothers to whom election is entrusted should, in the name of God, choose someone else. After the Pentecost chapter, the ministers and custodians may call their brothers to a chapter in their own custody's once in the same year, if they wish and it seems worthwhile. The friars must not preach in the diocese of any bishop if they have been forbidden to do so by him. And no brother should dare preach to the people unless he has been examined and approved by the minister general of his brotherhood and the office of preaching has been conceded to him. I also admonish and exhort the brothers that in their preaching their words be studied and chaste, useful and edifying to the people, telling them about vices and virtues, punishment and glory; and they ought to be brief, because the Lord kept his words brief when he was on earth. X. On the admonition and correction of brothers. Brothers who are ministers and servants of other brothers must visit and admonish their brothers, and they should correct them humbly and lovingly, prescribing nothing against their soul or our rule. Brothers who are subject to authority must remember that they have surrendered their own wills for the sake of God. Thus I strictly order them to obey their ministers in all those things which they have promised the Lord to observe and which are not contrary to the soul and to our rule. And wherever there are brothers who know they cannot observe the rule spiritually, those brothers should and may recur to their ministers. The ministers should receive them lovingly and generously and treat them so intimately that the brothers can speak and act as lords do with their servants. For that is the way it ought to be. The ministers should be servants of all the brothers. I admonish and exhort the brothers in the Lord Jesus Christ to beware of all pride, vainglory, envy, avarice, worldly care and concern, criticism and complaint. And I admonish the illiterate not to worry about studying but to realize instead that above all they should wish to have the spirit of the Lord working within them, and that they should pray to him constantly with a pure heart, be humble, be patient in persecution and infirmity, and love those who persecute, blame or accuse us, for the Lord says, "Love your enemies, pray for those who persecute and accuse you" (Matthew 5:44). "Blessed are those who suffer persecution for justice's sake, for theirs is the kingdom of heaven" (Matthew 5:10). "He who has persevered until the end, however, will be saved" (Matthew 10:22). XI. That the brothers should not enter the convents of nuns. I strictly order all the brothers to avoid suspicious meetings or conversations with women and to stay out of the convents of nuns except in cases where special permission has been granted by the Holy See. Nor should they be godfathers of men or women, lest it lead to scandal among or concerning the brothers. Whoever should, by divine inspiration, wish to go among the Saracens and other infidels must ask permission from their provincial ministers. The ministers should grant permission only to those whom they consider qualified to be sent. I enjoin the ministers by obedience to ask the Lord Pope for a cardinal of the Holy Roman Church to serve as governor, protector and corrector of their brotherhood so that we servants and subjects at the feet of holy church, firm in faith, will always observe the poverty, humility and holy gospel of our Lord Jesus Christ which we firmly promised. Translation by David Burr, with permission to reproduce for educational use. From the Medieval Sourcebook: "The Rule of the Franciscan Order". In commenting on the scriptures of Israel, the early Christian writers used its Greek translation, the Septuagint, in which the last letter of the Hebrew alphabet, the tau, was transcribed as a "T" in Greek. Prefigured in the last letter of the Hebrew alphabet, then, the stylized Tau cross came to represent the means by which Christ reversed the disobedience of the old Adam and became our Savior as the "New Adam." Saint Francis had first encountered this symbol when he was caring for lepers. He and the religious followers of St. Anthony the Hermit, who were working with him, used Christ's cross—shaped like a Greek "T"—as a protection against the plague and other skin diseases. 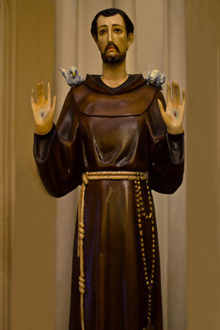 Saint Francis eventually accepted and adapted the "T" as his own crest and signature. For him, the "T" represented life-long fidelity to the Passion of Christ. It was his pledge to serve the least, the leper and outcast of his day. The Tau imagery was intensified when Pope Innocent III opened the Fourth Latern Council (1215) using the exhortation of the Old Testament prophet Ezekiel (9:4): We are called to reform our lives, to stand in the presence of God as righteous people. God will know us by the sign of the "Tau" marked on our foreheads. This symbolic imagery, used by the same Pope who commissioned Francis' new community a brief five years earlier, was immediately taken to heart as the friars' call to reform. Knowing that the best documents and decrees from "above" go unnoticed until they are translated into good deeds in the streets "below," Saint Francis stretched out his arms and proclaimed to his friars that their religious habit (tunic) was the Tau cross. Not only did the habit reflect the shape of this cross, but it also wrapped each friar in his life-long commitment to become a walking crucifix, the incarnation of a compassionate God. We know from ancient texts that Roman crosses consisted of two pieces. The stipes was the upright piece, fixed in the ground, often permanently. In restless areas and times with constant executions there could have been whole groves of them. The horizontal piece was called the patibulum; it weighed about a hundred pounds or so, and the condemned person was usually forced to carry it to the place of execution. Hence his name, the patibulatus. After the patibulatus carried the crosspiece of his cross out to the field of execution, he'd be attached to it with ropes or with nails—hence the term crucifixio, from crux, cross, and figo, to affix. Then he'd be hauled up so that the patibulum could be fastened to the stipes. We tend to think of the two pieces being mortised into each other to form the familiar Latin-cross shape ( t ). More probably the Roman army carpenters, with hundreds and thousands of crosses to make, didn't bother with that kind of fancy joinery. They probably just fixed a peg in the top of the stipes and bored a hole in the patibulum; that would make it easier to assemble the cross in a single motion, and it would make the weight of the crossbeam and the crucified man hold the cross together; it would result in a shape like the Greek letter tau ( T ). So, in his reverence for the tau cross, Saint Francis may have "understood" more about Christian history than most people suspect. 1. Kevin O. Johnson. Rosary: Mysteries, Meditations, and the Telling of the Beads. (Dallas: Pangaeus Press, 1997), 287–288.